By Louis Jacobson on Monday, November 6th, 2017 at 2:07 p.m.
President Donald Trump initially took some heat for how he dumped a box of fish food into a koi pond, but a closer look at the video showed that he had simply followed Japanese Prime Minister Shinzo Abe's lead. It was a story that seemed to reinforce stereotypes of President Donald Trump: On a visit to Japan, he was handed a box of food for a ritual feeding of carp, and after doling out a few spoons’ worth, he got impatient and dumped the rest of the box all at once. Initial reports of the food dump -- like this early video from CNN -- suggested that Trump acted on his own. This pushed the late-night Twitterverse and blogosphere into a tizzy. 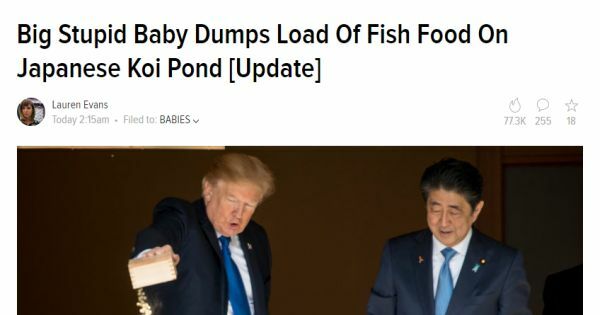 The website Jezebel posted a story headlined, "Big Stupid Baby Dumps Load Of Fish Food On Japanese Koi Pond." One problem: Trump didn’t just decide to dump his food on his own. Video shows he was following the lead of his host at the koi pond event, Japanese Prime Minister Shinzo Abe. Here’s a gif and a video (and another video) showing how events actually transpired -- first Abe, then Trump. Several journalists took to Twitter to correct the record as soon as it became clear, including Bloomberg’s Nicholas Wadhams, the Washington Post’s David Nakamura, and freelance journalist Yashar Ali, who went so far as to delete one of his previous posts and explain why. Other media tweaks were less forceful. The Jezebel post had not been updated by the time we found it around noon on Monday. It was later updated at 12:30 p.m., but with this addendum: "Many people have pointed out that Abe also dumped his fish food into the pond. This does not change the fact that Trump remains a big, extremely stupid baby, though I should also have noted that he is also racist, sexist and thoroughly incompetent. Thank you." Other reports we viewed around the same time, such as those from CNN, the New York Daily News, and the Telegraph, mentioned that Abe was first to dump his box, but usually did so several paragraphs into the story. A story by the Independent mentions that Abe was the first to dump his box, but the headline gives a different impression: "US President trumps Abe by upending box of food into Tokyo palace koi carp pond." More transparent was the tech-focused website Gizmodo, which posted a full story headlined, "That Viral Photo of President Trump Dumping Fish Food Is Very Misleading." The Gizmodo post interpreted the media's reaction this way: "In the wide world of media mistakes, Koigate is probably somewhere between a spelling error and posting the wrong hyperlink. But you can be sure that we’ll be talking about Koigate for some time as an example of what’s wrong with the media. Because nobody is operating in good faith anymore. The year 2017 and beyond is simply a contest to see who can be outraged over the most minute details of any scandal. All while very real scandals are dismantling American democracy." Trump adviser Kellyanne Conway called out journalists on Twitter: "Presumptive negativity; always ready to pounce on @POTUS. Retweet rather than report. #factfree." Say President Donald Trump got impatient and broke decorum by emptying his box of fish food all at once.